Dim from Greece. Sent 21 Apr 2015. Take away shop only but products of high quality there so, if you're a smoker in Hoorn, go for some shopping. Val from Romania. Sent 27 Oct 2014. The location of the coffeeshop is in an industrial area, about 3.5km from the city center of Hoorn. The place itself looks very nice, and also quite different from other coffeeshops. It is very clean, with a very relaxed atmosphere, giving the impression of a pharmacy. 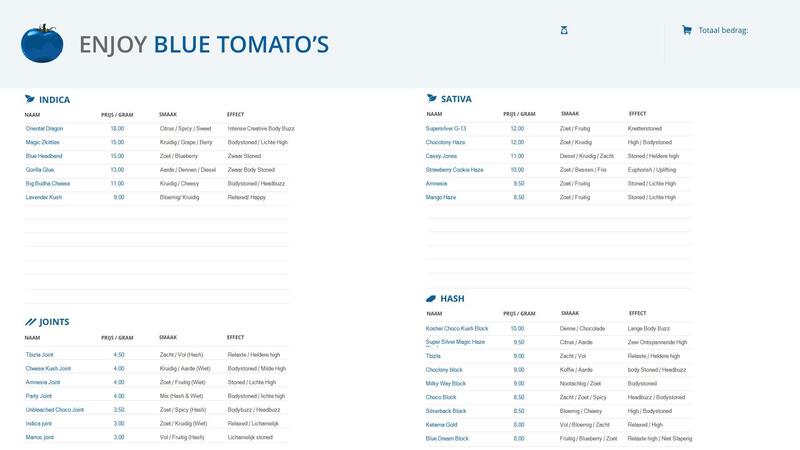 The menu is very good and varied, with multiple options of indica and sativa. The prices are also OK, ranging from 8 to 14 euro per gram. All in all, it's one of the best coffeshops I've came across, one that I'll definitely return to soon :D.